Multiply waste by the number of people involved. The capacity of teams to waste time and resources staggers the imagination. It’s one thing to tolerate one person wasting time. But, the amount of time and resources stalled teams waste is incomprehensible. Pretend things are fine in order to keep the peace. Stay the course when it isn’t working. Focus on what you can’t do. Nothing is worse than a self-affirming loser. 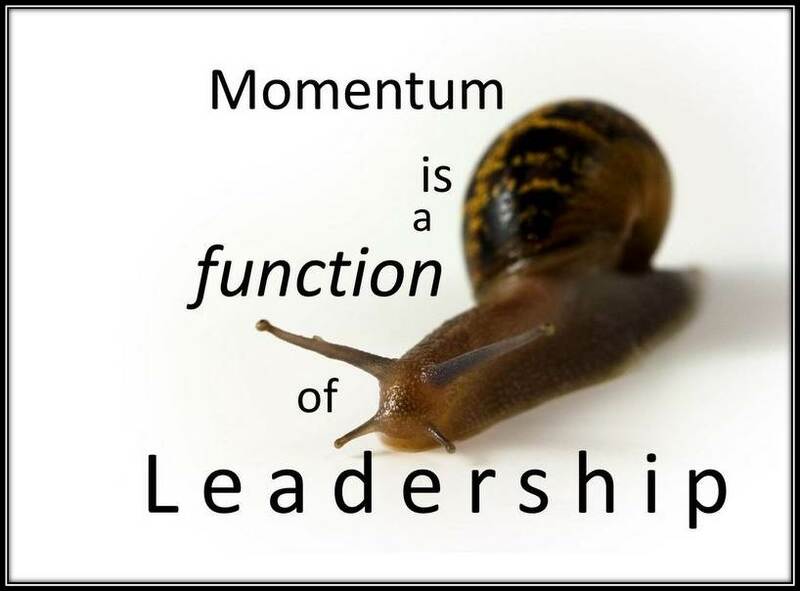 Momentum always slows apart from leadership. Feeling unsupported by upper management. Momentum is a series of small wins. Leaders are responsible to fuel momentum. Monitor and fuel energy levels. Success requires energized people. Invite upper management to pat backs. Don’t punctuate compliments with suggestions. Expect people to step up. How can leaders build momentum? Work – and life – are good when you are on a roll, and one of the leader’s top duties is to keep the snowball rolling. Your columns are always great, Dan, and this is one of your best! Thanks for stopping in Joe. Love the “on a roll” language. I agree with what you say here. One of the things that i used to do, when I was rebuilding my team in China, was to continuously celebrate small wins. Also, when there was a failure, or a setback, I rigorously analyzed the cause, and came up with action steps. I took blame away from the individual. Thanks Rajiv. You remind me that Jack Welch said, we don’t celebrate enough. I’m glad to share the journey with you. I’ve heard “There is no ‘I’ in team.” Teams are made up of individuals, each starting with ‘I’. Can a healthy team maintain momentum when one member is lagging or resisting? Thanks Duane. One bad team member hampers effectiveness by as much as 40%. It’s devastating. No. 11 Failure to address important issues. “Doesn’t anyone see that elephant?” Dealing with that as of this very moment. Everyone sees it, has acknowledge it including those who can do something about it but won’t. Frustrating beyond words. Thanks Ron. The good thing is that once you name the elephant and take steps to deal with it, momentum returns. I think people are waiting for someone to take the lead by courageously calling out elephants. Well a small change over time ends one up in a completely different place. Momentum is not a function, it is a result of Leadership. Just my opinion based on my experience. As far as lists of excuses, not a big fan. I have GOT to keep things simple and root causes are simple for me. So teams are made of people. So what trips up people would therefore be the same as what trips up an assembled group of people. I have found what trips me up is lack of focus and commitment and chasing excuses to pin my lack of results on. Entertaining YES, productive, not so much!!! I have to have my WHY so big and clearly defined when it gets tough I forge ahead instead of checking out those bright shiny list of excuses. My WHY big enough and my commitment, string as steel! Just how I sees it!! My story and imma sticking to it!!! Thanks Scott. The small change approach is often the only one available. It’s that or nothing. In every team there will be a handful of people who are willing to help the greater cause and propel you over the top. Identify that guiding coalition, serve and feed it relentlessly and don’t chicken out when dealing with your laggards. There are thousands of people who can replace your mediocre talent. There aren’t many who can replace your gems. Serve the stars well and momentum will be hard to stop. Thanks Alf. Brilliantly clear. So, the laggards you have are no better than the laggards you might get if you replace them. leaders should let the team execute and focus on clearing road-blocks – they feel affirmed by the leader going to bat for them, and it keeps them a-political and out of situations where they can lose goodwill which is important for cross team function. Thanks Bill. Show me a leader who can run interference for the team and I’ll show you a leader who’s helping others succeed. I worked with two great leaders who cleared road-blocks, one via building consensus slowly, and the other who plowed through all opposition. I was lunching with the latter one day when he mentioned that in school, he was both the center and middle-linebacker. Ah… it hit me, the root of the problem solving approach. That helped me work better with him. An exhaustive list of knowing and getting momentum. One thing that also drains momentum in team in perception. When team perceive drained, it loses momentum. Many times, despite making more effort, we do not believe what we do. We do just because it needs to be done. So, team feels directionless. Many times we already create positive perception about our effort, and hence whatever we do, we feel that we are going right. So, it is very important to have positive perception. It fuels positive energy and hence creates momentum. In the organizations, as you have rightly mentioned that leadership support is very essential. When leadership support is there, environment get supportive. And opposite is equally true. When leadership support is not there, environment is also draining. Actually top management support creates vibes. And it is significantly helpful in supporting and maintaining momentum. Therefore, I would say, feeling of being dejected, isolated and being perceived negatively also play crucial role in draining energy. And leaders can build momentum by creating vibes of positive energy that goes long in creating and supporting momentum. So very true. I was in that situation not too long ago after rallying a Team of 43 who had never had a Manager before or any attention from HQ in AZ. In 18 months we pulled the Team together over five states and moved to the forefront of the three Regions with the lowest lag days, lowest tasks, and best cross training especially since no one had ever facilitated having all access to all clinics available to all coders. People were afraid to take time off because of the lack of coverage which burned them out. Now we had a solution, momentum, structure, recognition and leadership. It made all the difference in the world and at the same time ruffled some feathers with upper management because the hard questions were now being directed to them by C-Suite and the kudos were coming to our Region and appropriately so. As the old saying goes “Never dim your own light just because it is shining in the face of another” These people didn’t know each other. Some worked two blocks from each other and had never met, spoken or acknowledged each other. That is totally different now. They are a cohesive and confident unit sharing knowledge that will help them grow both personally and professionally. A big problem I see in the workplace nowadays is that managers are supervising areas they have little expertise in, or they have employees they manage that work in areas they have little expertise in. This causes a huge downswing in momentum, as it is really hard to get support and backing from management if they don’t even know what you do. What’s equally unfortunate for the employee, is the manager will only be able to assess the quality of work based on what they know, even if it is a very small part of the employee’s job. This will leave the employee very frustrated, and even concerned that their manager has a poor perception of the value that employee brings. What’s worse, too often I’ve seen managers in this situation not really try to learn what it is employees are doing, they just stick to what they know. The manager will get frustrated because they feel he or she should work on their priorities first, without knowing the priorities in the other areas. This will eventually bring anxiety and depression, and/or an employee who goes somewhere where their manager knows and cares what they do. I really believe this is part of what happens when middle-managers get cut at larger companies, or managers are trying to cover too many areas in small companies. There becomes a void in leadership and direction, and certainly momentum. Thanks John. Underneath your comment, I have a sense of the importance of feeling valued and understood. It’s hard to feel valued by someone who doesn’t understand us. I like all ten of the momentum-building behaviors. It was almost like reading an Agile play book, which is why that approach to projects and teams works so well. Great way to start the morning. Thanks. It’s cool stuff, and in many respects the principles are pan-applicable. Let me know if I should point you to some resources. Thank you for the momentum builders. I have a remote team that I need to motivate with a really big, painful project. Like bimuse, I will be using the list like a play book. Thanks Dunk. Remote teams really challenge leadership. Best wishes. In all of my meetings, I explicitly say that THE purpose of the meeting is for US to determine & commit to what WE need to accomplish during the coming week (with each of us knowing specifically what we need to accomplish to what standard by when) to keep the project MOVING FORWARD. Thanks Paul. Love your use of capitalization for emphasis. Your inclusion of commit along with “determine what needs to be done” can’t be over-emphasized. What good is knowing what to do if we aren’t committed to doing it. My staff often serve as team members on formal projects with project managers, business analysts, requirements analysts, subject matter experts, etc. Where we are at greatest risk of losing momentum is when the various roles — and related expectations — of the team members aren’t defined at the beginning of the project. Without those definitions, I’ve seen projects come to a standstill. Thanks Scott. So, not only do we need to define the win, but, we need to define the roles in order to fuel momentum. If we don’t know where we and others fit in, how can we work together? LOve it. The small wins are so important along with defining today’s wins. I think sometimes when you are going through a lengthy initiative or long cycle of change, people get tired and the momentum slows down. What’s challenging for me personally and for me as a manager is keeping people engaged longer term to keep up their momentum. I find that highly energetic and engaged individuals thrive on change and new things so in the absence of new projects, new assignments, or new direction, the momentum can slow down. So finding something new & exciting to keep my top talent engaged on a regular basis (and keep me engaged) is what I need to continue to work on. I believe that often it is the little frictions between individuals that are dismissed as “unimportant” that wear a team down- by addressing these issues early on, they do not develop into much larger barriers to productivity. I also agree about supporting the team players who believe and work hard. In my workplace, there are definitely opposing factions- which has created unhealthy rivalries. I have been here 20+ years and am actively seeking another position. It is exhausting to simply avoid engaging in the pettiness. Leaders that must control slow momentum. Including team members in determining what the outcomes should be and empowering them to determine the strategies to get there creates momentum. Of course to keep the momentum going the Leader needs to follow up and keep the team accountable. If today’s win is going to be defined and celebrated it should be attainable. Failing every day can quickly reverse momentum and drain energy trying to play catch up. Thanks Alex. Bingo! An essential function of leadership is defining short-term wins while keeping long-term in mind. The tough job is focusing on now. It’s dramatic and easy to focus on distant vision. It’s gritty to execute that vision in tangible ways today. Best for the journey. Great discussion, have found the recipe for finding and keeping mo with teams has a lot to do with chemistry. Selish plug… Wrote a book about momentum “Finding Big Mo” about a golfer at Pebble Beach. Every team has people who possess qualities described herein. While some are really willing to contribute to the teams cause others think it is not their cup of tea. Still others think it is their way alone. It is managing such diverse set of people that the momentum is sustained. We are a small group of 5 people who have formed a core team to do consultancy . We also have the same diverse set. It is my duty to pull all together and sustain the momentum. The larger goal is clear. I am learning a lot as I go along. Thanks for the enlightening article.